1 November until 15 December. fishery in time to supply the valuable Christmas market,” Ms Foster said. with industry and based on the best available science. 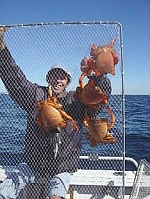 The closed season for spanner crab applies in all Queensland waters. call 13 25 23 or download the free ‘Qld fishing’ app from Apple or Google app stores. Please Remember Closed seasons Spanner crabs Throughout Queensland a closed season applies to spanner crabs from midnight 1st November to midnight 15th December inclusive.